A lot of things were the same as the 1972 except the following. The 100cc Berkshire and the 125cc Six Day still hace Sachs motors mounted on them. The side stand is mounted now on the left swing arm side. Girling shocks are factory mounted. The chain block area is made with extra brackets for better support. All models of PENTON now come equipped with white plastic PVC fenders, front & rear. The 175cc Jackpiner motor is still painted black and now comes with a 30mm Bing carb. A new gas tank, smaller for motocross, is 1.8 gallon and is still made of fiberglass. The head lites are either a bowl shaped 5 3/4 inch diameter or a small 4 inch diameter bullet shaped design. Year 1973 1/2 (June 1973) New Hare Scrambler Model Introduced. A new 250cc PENTON called the Hare Scrambler is brought over with a new KTM motor. Some of the dirt bike magazines wrote articles on this bike and called it the Mint instaed of the Hare Scrambler. This model has a gold gas tank and air box with dark green number plates. The 250cc KTM motor is painted black, has a 6 speed transmission, a Motoplat ignition which was made in Spain, and a aluminum cyclinder and head with a 34mm Bing carb. The swingarm is a new disign, comes with a brake linkage mounted on the right side and a conical rear hub. A new style high breather frame for all PENTON models. The exhaust pipe has a 2 ported outlet muffler fastened on with two nuts and bolts. The muffler is shaped vertically oblong. All PENTON models still have 32mm Ceriani front forks except the 250cc Hare Scrambler model which has 35mm front forks. The exhaust pipe has a removable chrome shield on it, with slotted cutouts. In October 1973 was the last of the gold painted Hare Scrambler models. At this point, the bike came with painted fiberglass exhaust heat shields/with number plate molded in them. Some bikes came with unpainted cyclinders even though the the rest of the motor is still painted black. A lot of things were the same as 1973 except the following. The Hare Scrambler is now painted red starting in November 1973. The 250cc moto cross version comes with green number plates, and the 250cc enduro version comes with yellow number plates. A longer seat is now 18 inches long starting in December 1973 and is 3 1/2 inches thick. The earlier seat was only 2 1/4 inches thick. Every PENTON model now comes with Ceriani 35mm front forks. The new designed gas tank is 2.9 gallon and is nicknamed the watermelon and it replaces the toaster gas tank used on some of the previous model years. The sticker on the gas tank is a long black and white stripe with the name PENTON on it. All the PENTON models come with color coordinated fiberglass heat shield,number plate combo. The rear brake arm is drilled with holes for lighter weight. All the KTM motors are finished in silver and come with a round clutch case cover. The 250cc and the soon to be released 400cc come with megaphone style exhaust pipe with a removable chrome tip on them. The 175cc Jackpiner came with the original and the megaphone style exhaust pipes. The KTM motors have a 2 piece style kickstarter lever on them. On the corners of the rear frame loop, there are new rear fender mounts made from tin and are contoured stamped. The models that have KTM motors now come with Akront high shouldered rims and conical rear hubs. The head lite is a large bowl shape. The 100cc Berkshire and the 125cc Six Day are still fitted with Sachs motors and come with the early style 175cc Jackpiner exhaust pipe on them. They also still have the barrel style hubs and chrome rims on them. This is the last year for the 100cc Berkshire model with a Sachs motor. Some of the things were the same as the 1972 Mud-Lark Trials bike except. This PENTON model has a tail lite and a head lite. Comes with HI-POINT knobby tires on it. Was said to be a "Dual Purpose" machine in its advertising. The gas tank stickers were red & white and said "Cafe Motocross" on them. The sachs motor was a 152cc size and even other sizes were found on some of these bikes. A lot of things were the same as 1974 except the following. The new 400cc Mint model is introduced with a new KTM motor on it. 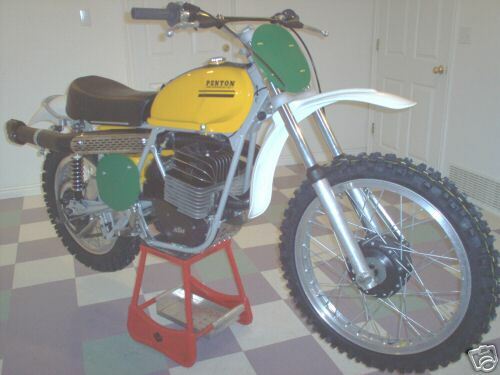 The PENTON Mint has a gas tank painted and air box painted in white and has yellow number plates. Although the mint was called a 400cc bike, it was actually was 352cc motor with a Spanish Motoplat ignition, a 6 speed transmission, cast aluminum alloy cyclinder and head and has a larger 38mm Bing carb. A new designed frame for the 175cc & 250cc and the 400cc KTM models come with a 6 position shock mounting feature. The 100cc and the 125cc Sachs models still have the earlier designed style suspensions on them. The new Sachs "D" motor for the 125cc is introduced. Ceriani gas shocks are now on the PENTON. A longer GP style seat with 21 inches in length and 3 1/2 inches thick is on the PENTON. The air box that was mounted on the right side is eliminated. The gas tank is now held on with 2 long spring cables with an aluminum bracket under the gas cap too keep them lightened up straight. A new rear fender "U" shaped is put on. PENTON bikes now come with aluminum brake stays. In late 1974, 200mm non-ribbed forks, with quick release rear brake arm and front brake arm with holes. In January 1975 a reinforced lower steering stem race and a long rear brake stay with a chain guard. In May 1975 Ceriani 200mm ribbed forks. This is the first and only year for the 125cc Sachs Six Day model to come with a special motocross frame, so you can mount the shocks in three different positions on the frame and one position on the swing arm. A lot of things were the same as 1975 except the following. The 125cc motor was made in Italy by the "Hiro" company. The Hiro motor was mounted in a 1975 Six Day model. The chain drive is on the left side. The total production of this PENTON model was approximately 20 bikes. Maybe even less. The Era of the Chrome Molybden Frame CMF). Now the model lines diverged into 2 very different models. The MC5 model and the Cross Country model. In December 1975 KTM brought out their own 125cc motor with a 32mm Bing carb. No longer using the Sachs 125cc motor. The 125cc KTM motor has a black cyclinder and head fins with the words "125 KTM" casted in the side of the cyclinder, with a gear box done in silver. All of the larger motor sizes are finished in totally silver. The starting serial number for the MC5 was 55000000. This is for the MC5 models only. This is the first year for the MC5. MC meaning motocross and 5 meaning 5 speed transmission. Some were later found with 6 speed transmissions. The MC5 model came in all sizes. 125cc-175cc-250cc-400cc. A new non breather frame and a swing arm with an magnesium air box. Marzocchi shocks are standard equipment and are mounted at 45 degree position with no different adjustment mounts. A motocross seat with an integrated rear fender. Leading axle Marzocchi or Ceriani forks. The color is now orange with yellow number plates. The MC5 gas tank sticker is a long wide black and white stripe with the words "PENTON" in white. West coast KTM bikes were mostly red and a few of the very first MC5 400cc bikes were white. European models were done in blue. This model was often called the GS6 even though the GS6 came out the next year. The frame and shock setup were the same as the 1975 KTM powered line of PENTON bikes. The rear brake and seperate chain guide is the same as the 1974 model. A new 2.9 gallon "toaster" gas tank with styling similar to 1972. The gas tank has the PENTON name in black, surrounded on 2 sides by black & white L-shaped stripe. The front forks are either Ceriani ribbed or Marzocchi. Marzocchi shocks on the rear. The rear brake stay is a short style, although some advertising shows a long style. The head lite is Preston Petty or a similar style molded plastic with a number plate. It comes with a trip V.D.O. speedometer. It is equipped with Sun rims. First year for the GS6 model. (GS means Gelande Sport. It means Terrain Machine in Austrian. The 6 means 6 speed transmission. The MC5 is the same as the 1976 except new black with white trimmed C-shaped sticker around the word "PENTON" which was in black. The frames had a slight noticable modification on some brackets as compared to the 1976 where the rear of the seat bolts on. Some frames had the option to mount the foot pegs in 2 different height settings. The exhaust pipe had an extra strengthening gusset on top where the silencer is welded on to the pipe. The starting serial number was 70100000 (For GS6 models only). It has the MC5 frame styling with the exception of new high breather tunnel type backbone. The new enduro gas tank, side panels and combo headlite number plate were all painted orange. The sticker on the gas tank is like the 1976 Cross Country model. It has leading axle Marzocchi front forks. Choice of Lectron or Bing carb. Same as the 1972 Mud-Lark model except the following. This is the first Woodsman model. The gas tank is polished aluminum and orange finish. It has PENTON white PVC plastic front fender and Preston Petty white IT (Integral taillight) rear fender. An upsweep expansion chamber (Husky type) with a muffler and a heat shield. It has full enduro lighting complete with large bowl shape head lite. The seat is 1974 PENTON type being 18 inches long. The frame turns up behind the seat to accommodate the Preston Petty fender. Year 1977 K-R )Kenny Roberts Model. A new short tracker model introduced in mid February. The motor is a 250cc KTM 5 speed with a 40mm Lectron carb. and Motoplat ignition. Carl Cranke designed expansion chamber. The frame is Kenny Roberts designed and tested by him personally. The handlebars and fiberglass body work is also designed by Kenny Roberts. The wheels and disc brakes are A.D.E. products. Ceriani front forks. S & W rear shocks. Carlisle tires. A Fantastic Ten Years in Motorcycle History.